My family is asked to review children’s books frequently. And frankly… most of the time… they aren’t age appropriate… even though I let them know the ages of my children. Being that summer break has started and school is already far from their thoughts… a very appropriate book landed on our doorstep. 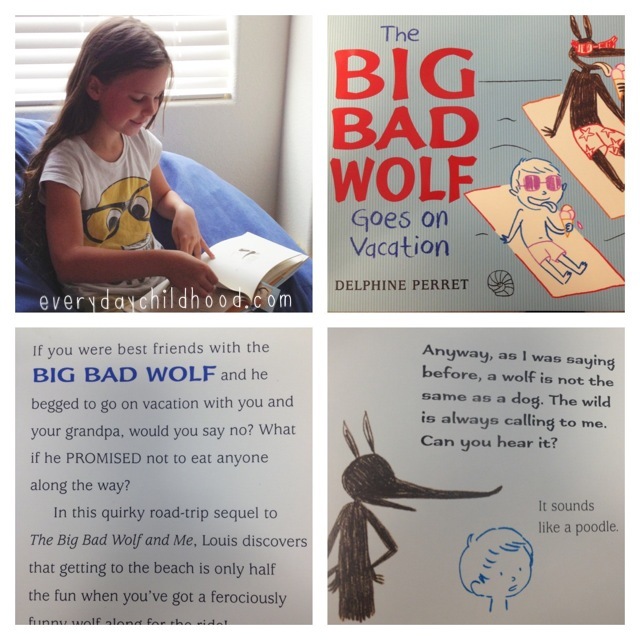 The Big Bad Wolf Goes on Vacation: by Delphine Perret. This book isn’t chapters of wordy, educational text. It’s written in an entertaining style… reminiscent of a comic strip. The story revolves around the Big Bad Wolf (who is more than likely just a common dog) and a boy named Louis. They go on a roadtrip with Louis’ grandpa and hi-jinx ensue. Most of the humor revolves around the Big Bad Wolf and his unwillingness to accept that being “just a dog” is ok. In the end, Louis decides that “a vacation without a wolf, is like a beach without shells”. So… if you’re looking for some silly summer reading fun… I’d absolutely order this book. *Note: I was NOT financially compensated for this book review.